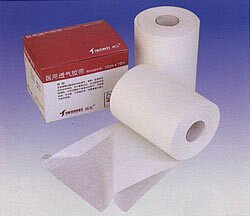 Surgical adhesive tape is a new-tape product. It is made of ventilate non-woven fabric with medical pressure-sensitive glue which is free from side-effects to human. Because of its ventilation, it can make skin ot breathe normally, excrete wound excrement and sweat, and prevent infection. It has stable stickiness.